Hot melted cheese between butter-fried bread. The American grilled cheese is the pinnacle of cheese on toast. Somehow the toasted sandwiches I grew up on, though delicious, fade beside its fat, cheesy bounty. I confess I’ve only eaten these at home using recipes from US books and magazines so they retain an air of the foreign, the exotic, if you can say that about something as prosaic as a cheese sandwich. It’s the frying that elevates them from the panini or cheese toasty. Grilled for Americans is cooking on a grill rather than under a grill in the oven, which they call broil I think. Fried both sides, this is no open sandwich or cheese on toast. A traditional Kiwi toasted sandwich is thin, two pieces of commercial white bread forged together around meagre fillings. Nothing wrong with that but this my friend is a different delight. Key to its glory is the butter-crisp fry. Go slowly on a cast iron skillet says the de Bruno Brothers recipe. Generosity of filling is important too urge the Cowgirl Creamery folks. Hot, crisp, oozing, it’s just the ticket on a cold day. It is comfort and homely, and the antidote I need for a nasty virus that has stolen my voice in a finale of laringytis. Today I will let the cheese sing for me. Bread- about 1 cm thick, not too many holes, any kind – flat baguette, loaf all good. Stale is fine, and I like seeded, though I slice brown bread a little thinner. Butter – normal salted is good. The solids help with crispy caramelisation. 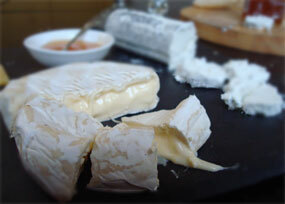 Cheese – I used Taleggio today, with rinds cut off and chilled in the freezer for 20 mins so it didn’t melt too quickly. Grate if you are using a block cheese like cheddar. Heat the cast iron pan on a medium-low heat. Evenly and generously butter one side of each slice of bread. This will be the outside. Slice the cheese, grate if using block cheese. Get your relish or other additions ready as you are going assemble it in the pan. When the pan is hot enough, place the first slice butter side down. Carefully spread the unbuttered side with relish, add the cheese and any other fillings and place the second piece of bread butter side up. Repeat but don’t jam too many slices in a pan or they won’t crisp. Adjust the temperature, and leave for 7-8 minutes. Check at 5 minutes as they’re easy to burn. When the first side is looking brown and delicious, gently turn them over. The cheese will have started to melt so they’ll stick together well. Fry the second side until crispy brown. Nothing better in the world than hot melty cheese!